"Is there an inevitable global violent clash unfolding between the world's largest religions: Islam and Christianity? Do religions cause violent conflicts, or are there other factors at play? How can we make sense of increasing reports of violence between Christian and Muslim ethnic communities across the world? 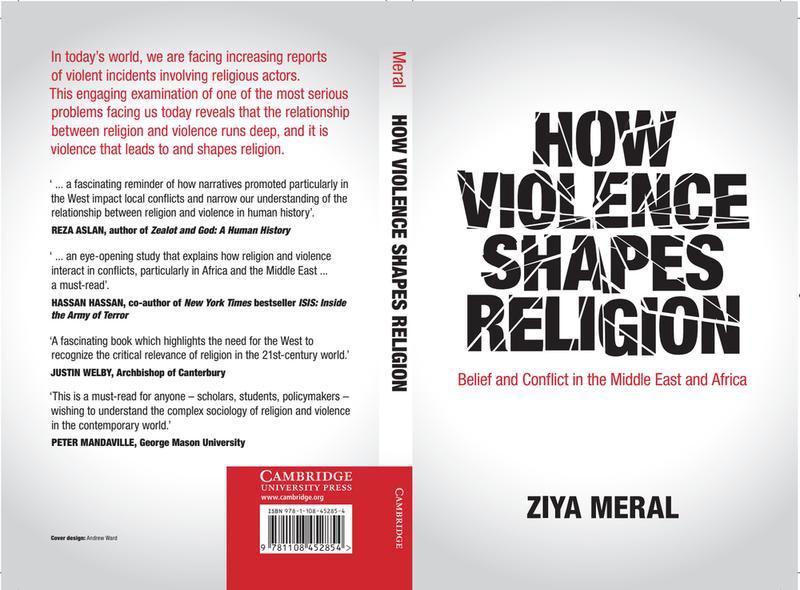 By seeking to answer such questions about the relationship between religion and violence in today's world, Ziya Meral challenges popular theories and offers an alternative explanation, grounded on insights inferred from real cases of ethno-religious violence in Africa and the Middle East. The relationship between religion and violence runs deep and both are intrinsic to the human story. Violence leads to and shapes religion, while religion acts to enable violence as well as providing responses that contain and prevent it. However, with religious violence being one of the most serious challenges facing the modern world, Meral shows that we need to de-globalise our analysis and focus on individual conflicts, instead of attempting to provide single answers to complex questions." France 24 interview with Ziya Meral on the upcoming elections in Turkey. Ziya Meral joins France 24 debate on Turkey and Europe..
Certain things about Turkey are very difficult to communicate to the wider world. Chiefly among them is how it is desired and fought for at all costs by its political actors, military officers and shadowy and secretive networks. While words like Islamism, Ottomans, Secularism, Sultans dominate op-eds on Turkey, the naked truth of its fierce public and elusive tensions is prebendalism, in which the grabbing of state power and revenues is only possible through a complex network of clientele relationships and can only be maintained when a term in office predominantly serves the interests of that network and its wider constituency. It is executed within a modernist story of strong state, effective bureaucratisation, top to bottom grandeur nation designs, brutal maintenance of differences and elimination of threats. This is the sad summary of all political phases in the country from 1923 to now. The dreadful coup attempt on 15 July has revealed these bitter truths about the Turkish state once again. Turkey is no stranger to men in uniform seeing themselves as the guardians and owners of the nation, even if the nation itself does not see them so. The last coup in 1980 had horrendous outcomes for all and has taken decades to undo. Since then, the military has continued to interfere in politics. In 1997, a carefully orchestrated 'post-modern coup' by the Armed Forces led to the collapse of the then coalition government that had an Islamist prime minister, namely former Turkey Prime Minister Necmettin Erbakan. That coup unleashed a crackdown on religious Turks, creating both a strong grievance and a political momentum for Islamists to reform to be able to assume power again. All of that was done without physically taking control of the state. The ruling Justice and Development Party (AKP) was founded in 2001. It rapidly saw electoral victories shortly after that and faced fierce pressure from the previous owners of the state power. Yet, neither well organised protests in defence of 'secularism' (which means the ‘old order’), nor desires for a new post-modern coup by soldiers to force the Government’s impeachment, nor a court attempt to shut it down, worked. It made the AKP only stronger and able to win even more votes. The majority of the public did not have an appetite to return to the past, and opposition parties failed dramatically to offer an alternative future. From 2008 onwards, a series of court cases against soldiers and civilians accused of planning coups saw a large number of high-ranking officers lose their posts. Most of the cases did not result in convictions. Eventually it became clear that the arrests had expanded beyond legitimate questions onto weaker and weaker grounds all with a clear political agenda. It was within such a context that both AKP supporters as well as secularist AKP critiques began voicing their beliefs that these court cases were attempts by the Gulen movement to expand its networks within the state structures, particularly military and judiciary. Former Chief of Defence Staff General İlker Başbuğ, who was convicted of heading a 'terror organisation' and coup attempt in August 2013 then cleared in March 2014, recently said that he had warned Erdogan that the Gulen movement networks were taking control of the military and ousting non-Gulenists, and that they will next seek to oust President Erdogan,which Erdogan shrugged off. Subsequent legislative changes and wide public support made both the closure of parties more difficult, but also curbed the military's political reach. With an unprecedented levels of votes, seeming defeat of the old Kemalist state elite and rapid economic growth, the AKP's power seemed unstoppable. Initially a party pursuing positive reform projects while facing continual challenges, it went on to assume the role of the party that governs the state comfortably and enjoys powerful state structures. But with great power came great failures, most of which could have easily prevented. The AKP soon began to draw criticism both domestically and internationally for its own prebendal tendencies both culturally and economically, and ambitious foreign policy moves that dangerously punched above Turkey's weight. The AKP success story had lost its lustre, and now was reminiscent of a system it was once a victim of. We might have not foreseen a new coup on the horizon back then. Retrospectively, it is clear that a new competition over control of the state was unfolding with increasing intensity. The first visible signs of a clash between a new secretive network and the elected AKP government were in February 2012. At that time a prosecutor went beyond his remit and requested to question the head of Turkish National Intelligence Agency (MIT) Hakan Fidan on a peace process he had led in direct talks with the Kurdistan Workers' Party (the PKK). When Fidan refused to give a statement, a large group of police officers attempted to arrest him and a few others. Arresting him would have been a major blow both to Erdogan and the Government's entire attempt to address Kurdish issues. Then in December 2013, mysterious (well, anonymous) social media accounts started leaking phone conversations and recordings not only between President Erdogan and his son, but also ministers, and even security meetings over Syria that included ministers, the head of MIT and military officers. While the carefully selected and narrated leaks made a case for corruption among cabinet ministers in the AKP government, other leaks and spin continued to fuel narratives around the Government policies on Syria and this time even included claims of weapons being sent to Nigeria with a hint of wild claim that AKP was supporting Boko Haram. Then on 19 January 2014, a group of Gendarme soldiers stopped trucks heading to Syria accompanied by MIT agents following the request of a prosecutor who again went beyond his remit. The entire operation and attempted case against the Government were clearly political and reflected a serious clash within state structures. All these incidents since 2012 were clear attempts to lead to an impeachment of the AKP Government. Yet, the March 2014 local election saw a surprising outcome for the AKP with the party winning more than 40 per cent of the vote, demonstrating that voters stood by the party even though corruption claims, Turkish policies on Syria as well as the handling of peace talks with PKK were critically discussed by party's supporters. That electoral success gave President Erdogan a strong hand in his clampdown of the Gulen Movement, which he and many others saw to be the main actor behind all these incidents. The state began seizing newspapers, schools and charities affiliated with the Gulen movement. Thousands of police and judicial officers were removed from their posts and scattered across the country on suspicion of having Gulen links, and some lost their jobs. The years 2015 and 2016 were truly precarious for Turkey. Not only did AKP-Gulen tensions continue, but Turkey also faced terror attacks from ISIS and the PKK. Hopes for a breakthrough had given way to a total collapse of peace talks with the PKK as both the state and the PKK willingly entered a full on clash in urban spaces with high risk and damage to civilians. It was clear that the Turkish state was now using an assertive military security strategy to contain the PKK, which was now seeking to maximise the goodwill it had gained internationally due to PKK-related groups fighting ISIS in Syria and expanding its territorial gains in Turkey's southern borders. Within the context of this renewed and high casualty war against the PKK, the Turkish military and the AKP government were seem to be moving on from former animosities and the military was once again showing its influence, particularly in policies on Kurdish issues. Tensions between the AKP and the Gulen Movement had also meant a sense of shared concern, thus increased partnerships between at least the nationalist wing of the military and the AKP. A new series of U-turns were appearing with the appointment of a new Prime Minister, Binali Yildirim, in May 2016, including Turkey wanting to ease tensions with neighbouring countries from Israel to Russia. In fact, it was the positive signs in 2016 that the AKP might be postponing its aim to change the constitution to give more powers to President Erdogan, and that it needed to focus on a normalisation of tensions within and outside of the country as economic and security risks were truly high, that made the coup attempt in July 2016 utterly out of sync with developments. Initially, the first question was why now. If it was prior to 2008, even prior 2010, it would have been clear why some soldiers would have attempted a military coup. Yet, July 2016 did not make sense and did not follow the pattern of previous coups and interventions. Some see an answer to this in the news that a legal process that had just began which meant that in a few days time a numbers of officers were going to be arrested, and in early August, the Supreme Military Council was set to decommission and retire a large number of officers for suspected Gulen ties. Therefore, some officers would have seen a last chance in this coup attempt. The hurried nature of the attempted coup eventually made sense when it transpired that the plotters brought it forward after discovering that their plan was known by the MIT. The crumbling plans and chaotic attempts led to truly harrowing scenes of use of force against civilians and landmark sites such as the Turkish Parliament. They had completely underestimated how the public and rest of the military would react. The Government was saved and a bloody civil war and utter chaos were prevented both by the brave public and vast majority of the military and police that stood against the coup plotters. Now, the question that is still difficult to fully and firmly answer is who was behind all this? The military culprits have been caught red-handed, yet clearly they have partners across state structures from the judiciary to ministries. The government seems set to pin it all down on Gulenists. There are plenty of confessions by the coup plotters and former Gulen followers in the news in Turkey, though they too pose a complex challenge. Some are unreliable, some clearly have carefully crafted statements, while others include plausible claims. Some are inadmissible due to allegations of physical abuse suffered by some of the soldiers involved in the coup attempt. The challenge to tease the truth out from these, however, does not diminish some legitimate and real questions over the Gulen Movement. It is difficult to deny involvement of Gulenist officers in the coup. Given the nature of Gulen movement, it is implausible to think that such high ranking officers would have acted on their own without at least informing or seeking at least tacit approval from their higher up leaders within the movement. While direct links between Gulen and the coup attempt is yet to be proven, very public political lines Gulen, his followers and media outlets have taken since the start of fall out between Gulen and Erdogan seem to have lead vast majority of the Turkish public to mistrust statements by Gulen followers denying any involvement in the coup attempt whatsoever. There are peculiar links in events since the trials of soldiers to Hakan Fidan incident to corruption scandals that raise serious questions about Gulen movement involvement in attempts to shape the state and oust an elected government. That is why purges of Gulenists across state structures, closing of businesses giving substantial funds to Gulen and Gulen media outlets are still widely supported by the Turkish public even with not much public direct evidence of Gulen leading the coup attempt thus far. Apart from Gulenists, the coup attempt also clearly included non-religious officers angry at the Government for the direction the country was heading in, opportunists who joined the coup attempt thinking it will succeed and thus could mean promotions, and the clueless who found themselves following orders without knowing what was going on. This was particularly so for the poor conscripts which make up the largest portion of Turkish military man power. Thus, clearly other factors came to play here, such as the weakened and chaotic state and legal structures that have continually seen political moves rather than rule of law and fair order. The coup emerged as a 'freak storm' with the coming together of many tensions since 2013 with the never ending undercurrent of soldiers and secretive cliques wanting to "save" (i.e. control) the state. More than a month after the coup attempt, there are worries that the Government is now exploiting the coup and pushing its own agendas further while so many things are still not clear about what happened. Purges and arrests continue, while some legitimate, some looks out of proportion. There are worries that people who have nothing to do with any of these sinister projects are facing life-long damage from the fall out of the coup. Questions of who will now fill up all these empty state posts are being asked: AKP loyalists? Other religious networks that support AKP? If so, is Turkey set to repeat the same mistakes? We, the public, who do not see the full picture but can only try to make sense of the tangible facts before us, will always be puzzled and uncertain about the exact details and truth of the claims we hear from all sides. Government pressure on media and self-censorship it leads to make it very difficult to sort out the truth from misinformation. The full picture might still be blurred, but why the coup happened is simple. Many Turks have found a comfortable explanation in conspiracy theories involving foreign governments. Some are pushing their agendas against the US and NATO by claiming they were behind the coup. There are even some who think President Erdogan masterfully engineered it himself to bolster his popularity. Fethullah Gulen, who lives in the US and leads his global network from there, described the failed coup to be a staged scenario like “Hollywood movie” with “a few jets and soldiers” in an interview with CNN, thus hinting at Erdogan as the instigator behind it all. But the truth is really boring, as usual. It is yet another episode in Turkey's history of competition for state control. While purges and reforms could patch some of the damage suffered in this latest attempt by secret networks, the main ill that has haunted Turkey for decades and continually resulted in assassinations, dirty secretive political games, aggressive state clampdowns and dangerous provocations that lead to street clashes and violence remains unchallenged. How can the Turkish state be made less appealing, open to less prebendalism, less all-consuming, but serving all citizens equally, recruiting and appointing on merit not on identity, acting within rule of law and under no clique's dominance? Unless this question is answered and solved, the Turkish state will continue to see new networks, new dark games, new ambitions to power and control, poisoning the pious and secular alike with its seductive appeal. What is diplomacy? Why is it pursued? To be sure, multiple answers can be given to this question: representing one's country to the world, opening up more economic opportunities for it, forming alliances to address shared concerns and advance national interests. No matter what, ultimately it boils down to one key word: influence. Whether your diplomacy is driven by advancement of human rights and good governance, or by good old naked national interests, diplomacy is ultimately about getting another country to share and take your interests, agendas and desired outcomes seriously. The bureaucratic humdrum that dominates practice of diplomacy often hides that truth. One lapses into seeing engagement with other countries merely through its formal channels, while forgetting that the two subjects that are alive and present at both ends. When this happens, diplomacy becomes a self-fulfilling theatre performance with very little real life impact, full of sound and fury signifying.. well, not nothing.. but press releases, tweets, outbursts.. If the underlying aim of your diplomatic reach to Turkey is influence, please continue to read the rest of this brief post. Some of the following will be no surprise to seasoned Turkophiles, and most of it actually applies to most countries in the world. Never Assume You Just Figured it All Out: Turkey is a complex country that often tricks its visitors to think that they have all sorted it out within a few months. Social and political layers go beyond seeming simple boxes. The simpler you think things are, the more likely that you are simply sitting in a room reading a newspaper from the country you came from. Realise the limited social networks you are in and outside of diplomatic representations in Turkey. Never take some twenty Twitter accounts you follow on Turkey to be the guiding framework of what is going on. Express humility and caution in your cables, listen to everybody (and make sure to go and find voices you do not hear in English), mind your own biases and limitations. Never fall into the trap of reducing complex developments down to a handful of political actors and their magical powers. That is so tempting, but for op-eds and not for informing policy makers back home and responding to developments in Turkey. No Tabula Rasa Posting: For you, Turkey might be a brand new posting, full of excitement, free from a baggage.You might have been doing language immersion and just counting days till you arrive in Ankara, and, if you are luckier, in Istanbul. Yet, you are entering into a long story, not only into your representation's current and recent legacy, but a profound sense of history. You might find it confusing to be given 'history lessons' by Turkish officials you meet, or some obscure historical thing thrown at you in a conversation as if it mattered now. But it does for your counterparts. It shapes their perceptions of you, at times for good and at times fuelling suspicion. Do not enter into deep domestic social and political tensions: Turkey is a highly polarised society, and its politics thrive in poking deep fault lines. Some of these are very real tangible problems, some are superficial culture wars. While you should continue your stand on basis of universal human rights norms, make sure to be consistent and not selective with them, and do not enter quick sand politics and social tensions while feeling like you should be saying something. Shame and Honour: Do realise, not just in Turkey, but in Africa, Middle East and Asia too, honour is important. How you express a concern, grievance, request, reaction and demand is as important as you being right. Handle social codes wrongly, your rightful statements will quickly turn into a harmful conversations spent on denying what you meant and how it has been understood. In such settings, harshest reactions and most direct conversations are best done in quiet meetings, not in public. In fact, if people believe in your sincerity, understanding and fairness, you will be surprised with how much they will be willing to listen to you and accommodate your points. Make sure you frame your negative points within substantial positive grounding. Culture, religion and values matter: If you had read far too many realist literature on international relations, the fluffy things like values, religion, traditions, symbolism might not matter much. True, realpolitik often kicks in, Turkish foreign policy takes sudden U-turns. Yet, such factors, their impact on decision making, relationships and public statements should not be ignored. There is a spectrum between essentialisation of a culture thus seeing an ontology in it and completely ignoring values that impact it. What might seem 'rational' conclusion to you might not be one that is seen 'rational' from where they stand. Mistrust to the World: All studies have shown that Turkey is among the low-trust societies of the world. There is a deep mistrust and suspicion, not just to foreign countries and international institutions, but even domestically. Often, people read intentions and grandeur theories behind a simple act or unrelated developments. Some of it is due to a history of politics and state structures that fuelled and maintained this, some due to very real historical events. Thus, not only you need to be careful with you say and do, but also with what you did not say or did not do. If you are consistent and genuine, sooner or later you will be loved much more warmly than you feel comfortable with. Because really, Turks are also some of the warmest, friendliest and loyal people. Speak and Act as Partners: Nothing rubs off Turks (citizens and officials alike) the wrong way than being patronised, being preached at, being scolded and treated as an inferior. They want to engage with you as a partner, as an equal, as someone who understands their reality and wants to work with them. Any hint of arrogance, holier than thou attitude will backfire. Really. Show Commitment in Moments of Crisis: This cannot be emphasised enough. Turkey produces more news items in a single month than couple of years for many other countries. It has gone through substantial changes last decade, and impact of its own steps and developments in its immediate region have put it into a truly precarious position. Continual terror attacks, political crises, mass protests, political pressure, over-use of power and even a coup attempt (what the heck), have brought the country to a truly strained moment. What they want from you more than anything is your partnership, commitment and firm knowledge that you care, and that you have genuine sympathy for the country (not merely for one political group or another). They pay attention to your responses (or lack of them) in moment's of crises more than you are likely to realise.In fact, such moments are not the time for taking the high ground, but superb opportunity for you to have direct influence. Interests and Calculations Differ: Just like you have certain policy priorities, calculations of risks and returns, interests on specific issues, Turkey too have them. Being an ally does not automatically mean Turkey will or could or should bypass them. When you don't get what it is you want, don't lapse into sending confusing messages of 'troubled relations' but reflect on alignment of interests and a good bargain strategy. I mean, if one goes with cliches, haven't you bought a carpet at the Grand Bazaar yet? Could more to be added to this list of tips? Yes. If you follow these, would you have cracked the Turkish Code? No. But at least you can be assured that you have more chances of having an input in the present and future of a vitally important country and opening a hard to close door for good relationships with your country. Media: Why did the coup attempt fail in Turkey? A one minute short video produced with the BBC World to answer to the question why the coup attempt failed. Ziya Meral interviewed by BBC World and BBC News channels on the coup attempt in Turkey on 15 July 2016. A talk by Ziya Meral on how our wrong assumptions about religion and violence lead to wrong inferences on the relationship between the two. He argues that violent conflict shapes religion and forces religion to accommodate use of violence, rather than the common belief that religions cause violence. A) Stop complaining about time limits given to you at the start of your talk. Yes, we don't have a whole day for you to unload everything you know. In fact, if you cannot communicate clearly a topic in a focused fashion in 25 mins, then you might not be the expert on it. More irrelevant side points made gives impression that you don't actually know the core issue, or if you do, that it is burred under an avalanche. B) Delete most power points, in fact, do not use them unless absolutely necessary. They always take longer than time given to you and distract your audience. You look amateurish as you keep skipping them, apologising and complaining about time given to you. C) Think of your audience and what they need to know and what you are asked to provide, and not what you are interested in or happy to talk about. It is disrespectful to people who invited you, who won't invite you again. D) Stop referring to your students in statements like "as I always say to my students". No one cares and that power and identity dynamic does not translate to professional world. E) Mind the attitude. I know it might feel like you are gracing an audience, but till you win a Nobel... They are gracing you by sparing their precious time and inviting you. Your attitude sends a lot of undesired messages, and limits your future chances in those networks. Often, you might not realise that there are people in the audience with same academic qualifications as you, with more actual work experience on the issues you are speaking about and access to information you will never be able to read. A little humility won't hurt, but might be very useful. F) Keep bios short and sweet, then on your CV you can make a giant roll of achievements (especially all those scholarships you got to pay your tuition fees ) and research interests, but in real life events, beyond a short paragraph it does not work. G) Do realise, that in an academic setting asking interesting questions and problematising ideas are helpful exercises, whereas in professional settings they are not. Put forward your analysis, clear and tangible implications. It is not a postgraduate seminar, but a chance for you to help people who need to make actual decisions on issues with real life consequences. I) Technical jargon within your discipline should be kept to bare necessity, and explained. Excessive use of words unique to your discipline and schools of thought you engage with do not work in professional settings and does not impress people. J) You have a lot to give the world, often more than you realise. Half of your intellectual capital should be spent on knowledge, the other half on how that knowledge translates in addressing issues we face. The imbalance between the two is often visible to your audience. K) Finally, this is a bit personal: fashion matters. When you are addressing a professional audience, you must dress accordingly. You might feel ideas matter more than how you present yourself, but surprisingly, even the postgraduate seminar fashion reflects particular social codes and dynamics. It is simply adapting to your audience, granted the aim is to influence them.